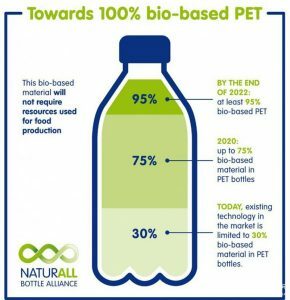 It is understood that the world’s two bottled water company Nestle, Danone together with a company called Origin Material in California, to form a coalition – NaturALL Bottle Alliance, to commercial production of 100% bio-PET containers. Coca-Cola has produced plant plants containing 30% plant material (PlantBottle), in recent years is very famous. Coca-Cola is also working with other companies to test production of 100% bio-plastic bottles. But this new alliance has seen the commercial production of 100% recycled PET plastic bottles of the future development of space. “The technology on the market today can produce plastic bottles with 30% bio PET,” said John Bissell, CEO of Origin Material. “Our breakthrough technology goal is to achieve the commercial production of 100% bio-plastic bottles With the help of alliance partners, Origin Materials will be able to expand its technology applications, and the trial production has now proven its viability. The company’s pilot plant in the western part of Sacramento (the capital of California) has successfully produced 80% bio PET sample plastic bottles and is expected to build a new plant this year to produce 60 percent more bio PET bottles from next year. At the initial stage, the production target is to process 5,500 tonnes of bio PET. PET is made of MEG and TPA. MEG in the PET raw materials accounted for about 30%, can be made from plant ethanol. PTA in the PET raw materials accounted for 70%, made by the PX, PX is a typical naphtha extract. Origin Materials technology converts cellulose to PX. The alliance hopes to develop a process that will increase the biomaterials of plastic bottles to 95% by 2020. The ultimate goal is 100%. “We believe that biofilm materials can be used as an alternative to traditional fossil materials.We form a team that enables the complementarity of resources and technology to accelerate the commercialization of 100% renewable and recyclable PET plastics.” Danone Group Research and Development Director Fredric Jouin said in a statement. Origin Materials uses cardboard, sawdust, wood and other biomass to develop biological PX. This approach does not occupy resources or affect food production. The future of its raw materials may also include rice husk, straw and agricultural residues. “It may be hard to imagine that in the near future, the industry will be able to take advantage of renewable packaging materials that will not compete with food production and create a better planet.” Nestle R & D Director Klaus Hartwig said in a statement. Welcome to contact PBM Custom Plastic Bottle Manufacturers in China. 2017 your best Plastic Bottle Manufacturers here.